I am back for this week's Tea Time with another lustreware, three footed tea cup and reticulated saucer made by Royal Sealy China, Japan. 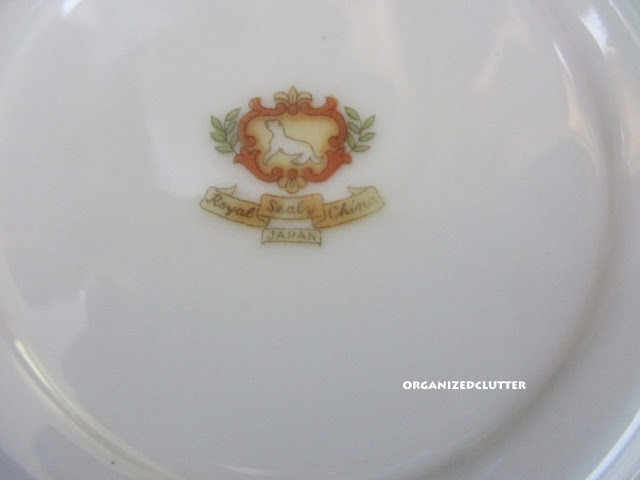 I have had this teacup and saucer for over 15 years. I think it was from my Mom but not sure. I remember when I started collecting tea cups and saucers that she got me started with a number of tea cups from her personal collection. Stunning! Everything about it is gorgeous. Thanks for sharing. 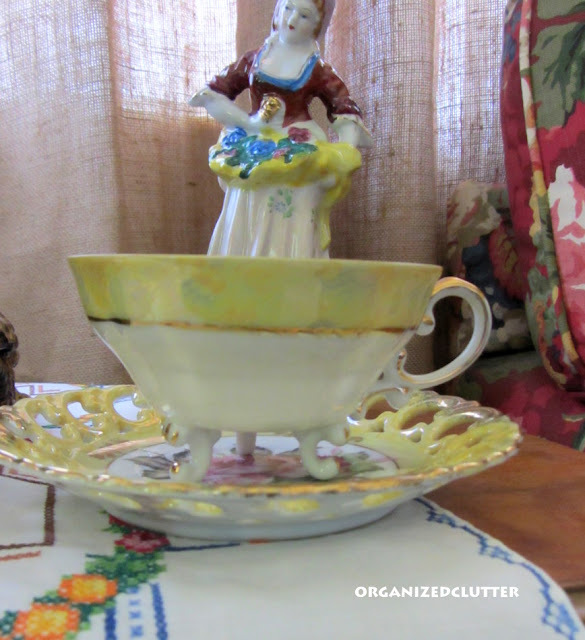 Your figurine looks like she was made to stand near your pretty yellow teacup. It is really lovely. 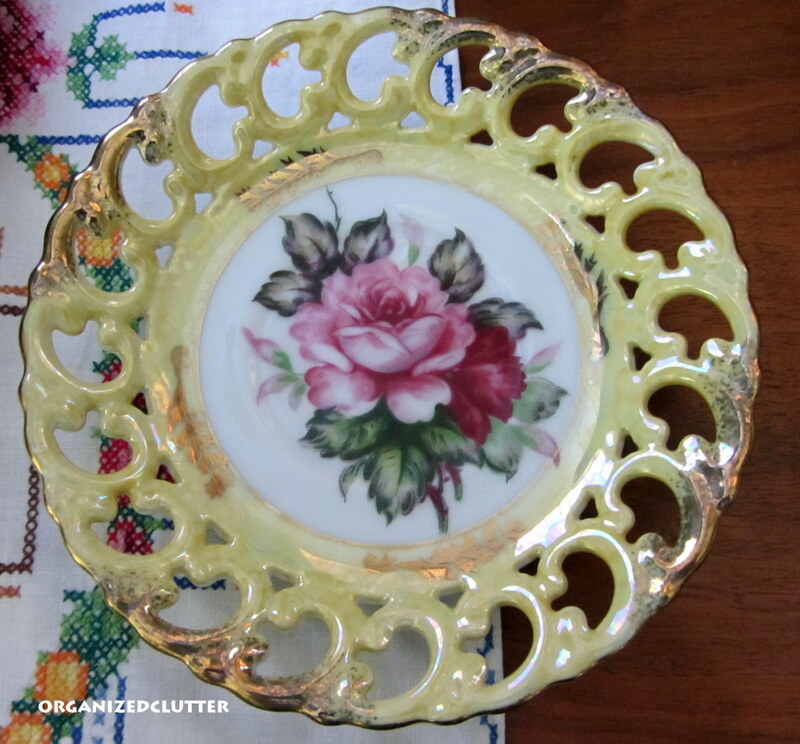 I adore that rose in the cup and on the saucer! Another gorgeous 3 footed etacup! I have a yellow as well, which I'm sure you noticied. Sort of an end of summer color, isn't it? Thanks so much for sharing your beauty and linking to Tuesday Cuppa Tea! What a gorgeous teacup!! I love china with roses. Always so elegant. Hi Carlene, Your teacup and saucer are just glorious! Such beautiful color! Thanks for sharing and have a great week. Your three-footed teacup is gorgeous! Love the cut-out pattern on the saucer and the lovely yellow color. Your lovely lady figurine is perfect with the teacup. Happy Tea Day! Having a saucer like that under a teacup would sure make afternoon tea special. The set is beautiful. That is a lovely cup and saucer! 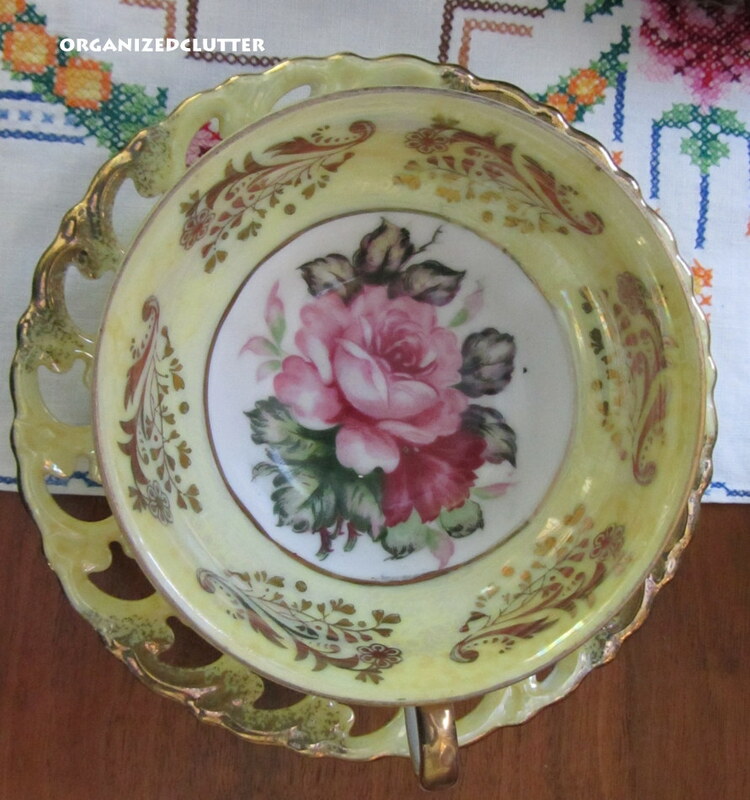 Carlene, your teacup and saucer is just gorgeous! 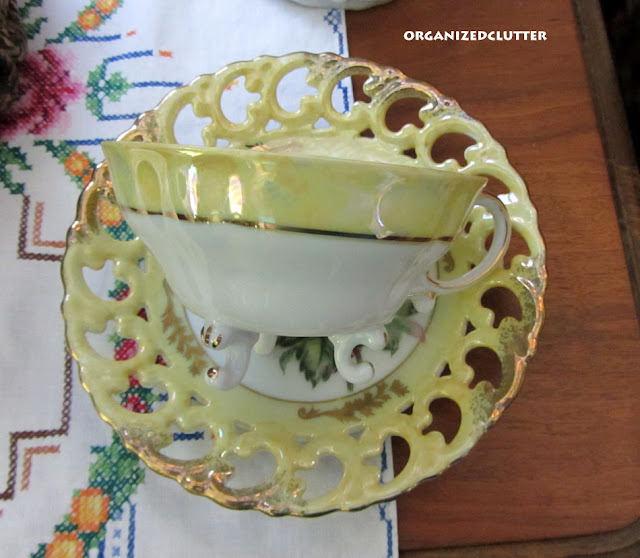 How I love the colour and the lacy saucer is so very pretty! Thank you for sharing it with us today and have a lovely week. 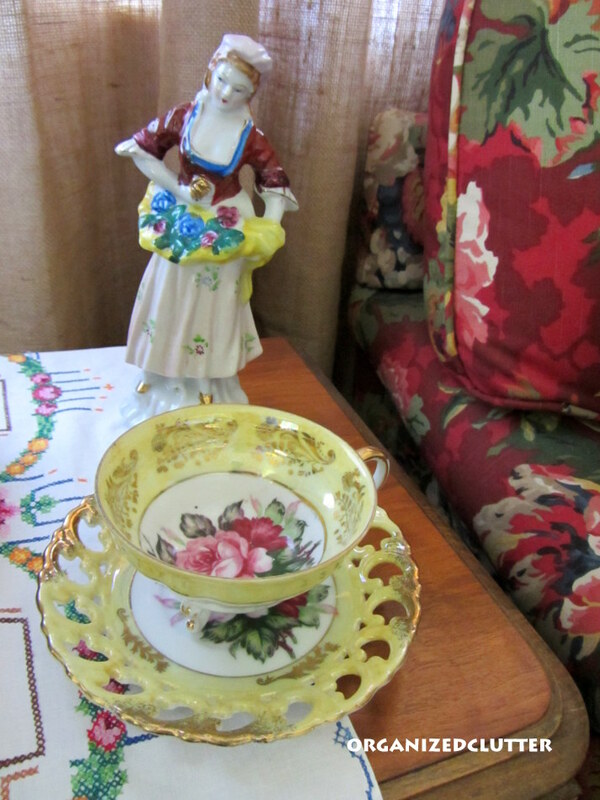 I am loving your pretty yellow lusterware cup! So pretty! The cut out on the plate is amazing too! That red pattern is just gorgeous! Carlene, Love this in yellow. I have a sage green one that has a rose in the moss rose pattern in the center! !